A. The steamy-hot Bread Pudding (NT$80) is made with a crusty layer on top and moist texture on the inside. Its delicate flavors are a great, hard-to-resist treat. 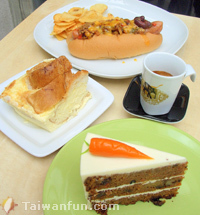 The signature Carrot Cake (NT$90), Hot Dog, and Mexican-Style Chili Sandwich (NT$150) are also popular choices here. B. My Sweetie Pie Bakery & Cafe is a long-term dream for owner Rainbow, who says that making desserts is a form of relaxation for her. Each day, you'll find eight kinds of cake displayed on the shelves, and the flavors change on a regular basis. Furthermore, if you would like your own custom-made cake, call to order one; an eight-inch cake is about NT$880.